Robert Michaels wrote an interesting post on Mercatus called Ohio’s Energy Efficiency Fiasco. Since I complained about rising electrical rates in 2012 and 2013 I was fascinated that a Northern Virginia college would publish a paper by a professor of economics at California State University about Ohio electrical rates. Talk about strange bedfellows! In 2012 I was ready to complain to state officials about the electric rate increase when I realized that my problems were pretty minor compared to problems faced by several public school districts whose budgets were blown out of the water with the rate increase. Despite all of the fervor I can say that not much has changed. My bill is much higher and Duke is inordinately interested in getting me to buy light bulbs from them. Here is the junk mail I got from Duke last week. So what could have gotten Mr. Michaels and Mercatus all upset? It seems that Mr. Michaels is concerned about free riders. Here is an example. Free riders are subsidized by higher bills for other consumers. Despite hopes that the EERS would encourage efficiency innovation that would produce “green jobs,” since the EERS became law there has been very little such innovation. Instead, utilities have relied heavily on lighting-related discounts for compliance. For some utilities in some years these discounts have accounted for more than 80 percent of EERS expenditures. 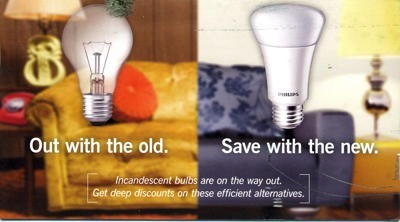 The problem for these utilities is that I still have plenty of CFLs I bought three years ago so I do not need anymore. He also complains about “riders” added to the distribution portion of the electrical bill to satisfy the whims of certain advocacy groups. My latest Duke electric bill shows that the combination of the delivery and generation riders is now 42% of my delivery charge. It really irks me that my electric bill keeps going up despite lower fossil fuel costs and improvements I made in energy efficiency. The problem is with distribution rate increases. Here is a graph of my annual electrical rate increases. It looks like the stupidity has subsided so why is Mercatus still interested? I think Mercatus is interested in the legislative fight to alter the renewable and energy efficiency mandates in Senate Bill 221 enacted by legislators in 2008. Many states have similar mandates but Ohio seems to be particularly foolish in writing S.B. 221. The supporters of S.B. 221 say these subsidies have created a renewable energy industry and the bill was about creating jobs. State Senator Bill Seitz begs to differ and told members of the Senate Public Utilities Committee, “Simply put, the economic projections upon which (S.B. 221) was based have turned out to be wrong.” I think the quickest way to get up to speed on the economic predictions upon which S.B. 221 was based is to read Jonathan Lesser’s study, Ohio’s Electricity Usage Reduction Mandate: The “Free Lunch” Paid for by Ohio Consumers. In that article Mr. Lesser says that since S.B. 221 mandates reduced electrical usage, it expects that electrical generation rates will go down. The economic logic used to justify S.B. 221 is that since the retail customer is saving money on these presumed generation rate decreases they can easily afford to subsidize renewable energy and energy efficiency projects paid for by the riders included in the distribution rates. The problem is that delivery rate increases far exceeded any savings I got from generation rate decreases. If the only renewable energy job created is to send me junk mail about CFLs, I think we can safely say that it has failed and it is time to work with businesses to change the renewable and energy efficiency mandates. The good people of Ohio can only go so far with bad legislation. This entry was posted in Economy, Electricity and tagged economy, electricity. Bookmark the permalink.